As part of the Apollo Next Giant Leap Student Challenge, middle and high school students will mimic many of the tasks involved in the Apollo 11 mission. If you could put anything on the moon to represent you and your community, what would you choose? Students across the country will need to tackle that question, among others, as part of the Apollo Next Giant Leap Student Challenge, a contest commemorating the 50th anniversary of the first human moon landing. 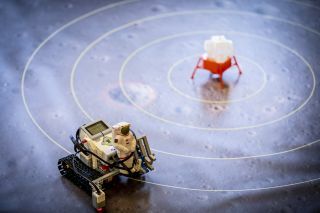 Created by a NASA educational program particularly focused on underserved communities, the challenge will ask participating students to land drones near the Apollo 11 landing site on a map of the moon's landscape, place a payload representing their community to leave behind on the moon and complete science activities. "We've designed this [program] to say, no, that's not right, being part of technology can be important for all persons in the U.S.," he said. "It doesn't matter whether you're rural, urban — it doesn't matter. It should be inclusive for everyone." That's why Winglee and his colleagues wanted to design an Apollo-inspired challenge for middle school, high school and undergraduate students, particularly those in underserved communities. The pipeline has been working with rural, urban, Native American and Latino communities in the Pacific Northwest for three years now designing programs that foster science, technology, engineering and math (STEM) skills while also addressing local priorities and ways of seeing the world. That means making sure the community's identity is expressed amid the science. "Our duty is to see what NASA does that has some component of relevance [to a community], so that the kids have two ways of thinking about their knowledge systems," Juan-Carlos Chavez, associate director of the pipeline, told Space.com. And with the 50th anniversary of the Apollo 11 moon landing fast approaching, Winglee thought it was time to think bigger, beyond the Northwest, he said. (Apollo 11 landed the first humans on the moon on July 20, 1969.) The result is a monthslong challenge designed to shrink the scope of the moon landing enough to make it accessible while retaining all the original mission's excitement. "I'm an old dude, so I was actually alive during the Apollo landing, and it was quite inspirational," Winglee said. "We have now a whole generation of young students who don't comprehend what it was like to take that first giant leap, yet we're in an era where there are huge innovations occurring in space." That message has inspired Anika Hidayat, an undergraduate student volunteering with the project. "Space is such a big goal for our society right now," she said. "There's so much left to explore." Hidayat will be on hand to help students tackle the challenges Winglee and his colleagues are posing. Students Cat Hannahs, Anika Hidayat and Christine Dien tackle some of the steps of the Apollo Next Giant Leap Student Challenge. The competition is designed to mimic some of the challenges faced in the Apollo 11 mission. First, students will need to build a lunar module. Then, they'll need to fly a drone carrying that module and land it near the Apollo 11 landing site on an image of the moon's surface. Next, they'll need to use a programmed Lego robot to leave the landing site, deploy a payload and tackle a geology challenge. In the high school division, students will also need to retrieve the landing module. Throughout the challenge, the organizers are hoping kids will connect with spaceflight without feeling like it is separate from their communities — to see themselves as engineers without feeling like they need to abandon their identities to succeed in the field. "It's way to diversify STEM by having the communities identify themselves in a creative way while celebrating the Apollo 11 mission," Chavez said. "At the end, the dream would be that we have these amazing engineers and scientists that are fully prepared to take on the positions at NASA and other industries that are hungry for local students to participate." Winglee echoed that sentiment. "Some communities say space doesn't mean anything to us, but by having them deliver a payload that could be relevant or meaningful to the community I think would have more impact," he said. "We want the communities to be vested and show pride in what their students are doing, and I think all of us would like to put something on the moon." Fifty years ago, the Apollo astronauts left plenty behind as they prepared to leave the moon — more than 100 objects total. Much of that was done for utilitarian reasons, a way to lighten the astronauts' load before their return by removing now-unnecessary equipment, from geological tools to camera gear to eight bags of human waste. But the astronauts left signifiers of their communities as well, including a memorial to astronauts who died during the Apollo 1 fire, a U.S. flag, and a disc carrying statements from four U.S. presidents and 73 international leaders. Perhaps the students' biggest challenge will be selecting just one token to represent their communities.